Like many of you I am passionate about books and we’ve both nurtured Little B’s love of the printed page since he was born. In fact our house is creaking under the weight of all the paper we’ve accumulated over the past eighteen months. But I realised that, ironically, I haven’t often written about our favourite books and this is a missed seam of inspiration for blog posts. So from now on I’m going to review a book a week – there are definitely more than fifty two on the shelves so I have at least a year’s worth of posts banked! I’ll try to post every Wednesday so I can call this series, with a distinct lack of originality, #WednesdayWords. Heh – I may even start a linky! 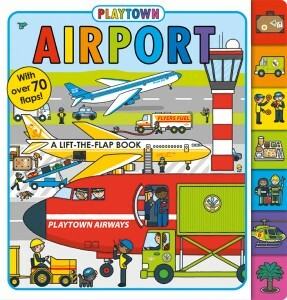 This week I’m kicking off with a blast of colour and exploration on every page as we discover the delights of Playtown Airport by Roger Priddy. Read the full review at dadwithoutamap.